Following the renewed killings in troubled southern part of Kaduna State where not fewer than 21 persons killed and property destroyed by suspected herders, Catholic Priests have expressed worry over the development. They said, in as much as people in position of authority will respond to issues as it affect people base on their religion, ethnicity and culture, peace is far from sight. The gathering, which has in attendance several Catholic priests, leaders and students was organized to address issues bordering on position of Catholic on Christian burial before and now with a view to inform all parish within Diocese of Kaduna the newest stand of the Archdiocese. Speaking in an interview with newsmen in Kaduna on Tuesday during the review of Extraordinary Jubilee of Mercy, Archbishop, Archdiocese of Kaduna, His Grace, Most Reverend Matthew Man-Oso Ndagoso said, the church is very worried on the spate of unjustifiable killings not only in southern Kaduna, but across the country saying, Nigerian leaders should be just in their administration of governance in order to holistically solve the problem. 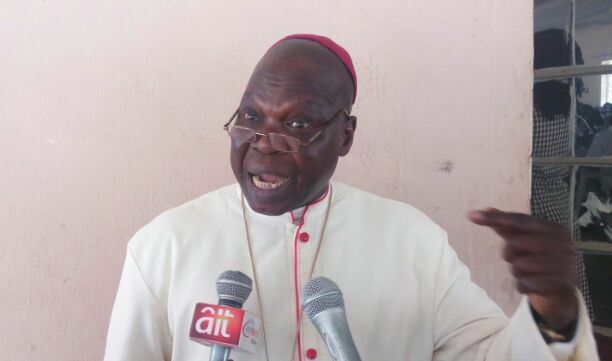 According to him, the Diocese has visited the troubled zone, talked with people directly involved, saw their situation and summed up that, lack of justice, equity, unequal distribution of resources are responsible for the wickedness been perpetrated against innocent souls. According to him, “we are very worried about killings in southern Kaduna. We are saying until there is justice, it will be difficult if not impossible to know peace. We have been to the place, we have seen the people, we have seen their condition which was a terrible one not meant for humans. We came back and see there was injustice in the land. “Here in Kaduna, whatever money that is coming from federal government cover and even IGR must have been meant for everyone in the state because that must have been released based on population. As the time we went, a lot of people who are predominantly farmers cannot even go to the farm to harvest their crops despite the so much publicised deployment of security personnel and huge financial resources that may have channelled on that course. “Another thing is that, the security personnel should do their work. If they have been deployed to secure the place, they should go and comb the bushes and not just staying on the main roads while the onslaught continues in unprotected areas. “So, it make no sense not to empower those that have been deployed to combat the killings. May be they are not even wellfed and perpetrators are using that to compromise them. We have heard it where money will be allocated for them to buy food and water but somebody somewhere will pocket the money. So if that happens, what do one expect from them than to take gift from locals and even from those they have sent to go and chase out. “We must address the issue of poverty on the part of the governs and ignorance on the part of the leaders especially in the North. Today, the North is the most backward in terms of education and what have you due to unnecessary killings and destruction of property. With all these developments, that education and development gap between the South and North will only continue if urgent step to address injustice is not taking”, he said.